Secrets Of The De Novo Pathway, Part 2: Is De Novo Right For Your Device? In Part 1 of this two-part series, we explored the history of the FDA’s de novo classification — what it is, why it was established, why it has been underutilized by medical device makers, and what the agency has done in recent years to make it a more attractive option. But is de novo the appropriate pathway to market for your novel low-risk device? This second installment seeks to help you answer that question by contemplating several key regulatory and business considerations related to the de novo process. From the regulatory perspective, the critical question to ask is: Do you feel confident that you can do a good job of mitigating the risk associated with your device in an FDA submission? Risk mitigation strategy is important for any regulatory submission, but it is especially important for de novo submissions. It is important to point out that there are many different connotations of risk. Most people think of risk in terms of the direct harm a medical device can cause to a patient. However, that’s only one type of risk; there are others. For example, what harm can be caused to a patient if we don’t use a particular medical device? Or consider the field of molecular diagnostics, which carries the risk of providing the wrong information. Let’s say you’re working on cancer diagnostics, and your device says that the patient does have cancer when, in fact, they really don’t. Or even worse, what if your device says that the patient doesn’t have cancer when, in fact, they really do? These are just a few types of risk, but there are others as well. How does a manufacturer know when to use the de novo pathway? Most importantly, they need to determine whether they can mitigate the risk sufficiently to get the device down to a Class II or even a Class I designation. If so, de novo is a viable option for your device. Do You Really Have A Competitive Regulatory Strategy? Viewing the de novo question from a strictly regulatory standpoint is shortsighted. You also have to be aware of the competitive landscape for your product — what the military call situational awareness. Do you really want to lower the regulatory bar, which could accelerate your product’s time to market but also make it easier for the competitors that will inevitably follow? The de novo question is as much a strategic business decision as a regulatory one. This is where the development of a competitive regulatory strategy becomes critical. When most people hear that phrase, they think it means, “What did my competitor do? What strategy did they use to get their product to market?” To me, that’s not competitive regulatory strategy. That’s playing follow the leader, because all you’re doing is trailing what somebody else has done. Competitive regulatory strategy means something very different to me. Anyone can design a regulatory strategy to get a particular medical device through the FDA to market. The real challenge is designing a regulatory strategy that will not only get your product to market, but also act as a barrier to entry to your competition. Ideally, you want your regulatory submission to make it more difficult for your present and future competition to get their products onto the market. I don’t look at it that way. If you have to jump through these hoops, how can you use those hoops to your advantage? Can you set those hoops up in a certain way so that you can get through them while simultaneously making it a little more difficult for your competitors to do the same? If so, you can gain a pretty significant advantage in the market. When you consider de novo in light of competitive regulatory strategy, the downside to pursuing this pathway becomes apparent. As discussed in Part 1, if there is no precedent (predicate) for new device, its default class is Class III. The goal of the de novo process is to down-classify new, low-risk devices to Class II or Class I, because it’s going to be easier for you to get your product onto the market. You also have to keep in mind, though, that you are also making it easier for your competition to get their products to market afterwards. So some companies opt not to use de novo, even when their products are well-suited to the pathway, because they don’t want to clear the path for their competition. The classic example a large medical device manufacturer — with a lot of money and resources — that chooses to forgo the de novo option, because its competition is a bunch of small companies and startups that are not as well-funded. Over the last few years, FDA has published several guidance documents either directly or indirectly related to the de novo classification. However, there isn’t a ton of information out there on de novo and other less commonly used pathways, like the humanitarian device exemption (HDE) and the custom device exemption (CDE). Quite frankly, the FDA only has a finite amount of resources, and they need to put the majority of those resources into pathways that are used the most often, like the 510(k) and the PMA. I hear from a lot of frustrated manufacturers who want to use the de novo but can’t find enough information. On the surface, this lack of guidance may look like a disadvantage. But to me, it’s a huge opportunity. Rather than simply doing what somebody (FDA) tells you to do, you can use it to your advantage and — to some extent — create your own path. Again, the goal of competitive regulatory strategy is to set a course that is the least burdensome to you and more burdensome to those coming after you. If you decide to go this route, do so with caution. I’ve seen the approach backfire on occasion: A manufacturer tries to make the path a little bit more difficult for its competitors but fails to consider the future regulatory impact on the next generation of its own product. You don’t want to set up future hurdles for yourself. So it’s a fine line — to a certain extent it’s like walking on the edge of a knife. Tread carefully. For a more detailed discussion of these and other topics related to de novo, check out the upcoming webinar De Novo Path to Device Approvals: Tips for Speedy, Successful Outcomes, which I will host on February 24 at 1:00 pm (EST). 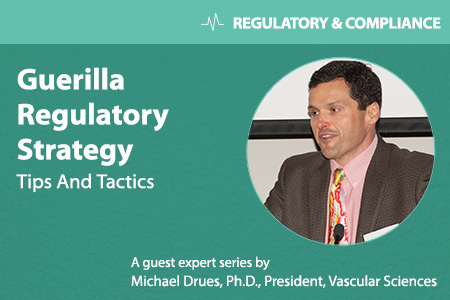 Michael Drues, Ph.D., is president of Vascular Sciences, an education, training, and consulting company offering a broad range of services to medical device, pharmaceutical, and biotechnology companies. He has worked for — and consulted with — leading medical device, pharmaceutical, and biotechnology companies ranging in size from start-ups to Fortune 100s. Drues works on a regular basis for the U.S. Food and Drug Administration (FDA), Health Canada, the U.S. and European Patent Offices, the Centers for Medicare and Medicaid Services (CMS), and other regulatory and governmental agencies around the world. He is also an adjunct professor of medicine, biomedical engineering, and biotechnology at several universities and medical schools, teaching graduate courses in regulatory affairs and clinical trials, clinical trial design, medical device regulatory affairs and product development, combination products, pathophysiology, medical technology, translational medicine, and biotechnology. He received his B.S., M.S., and Ph.D. degrees in biomedical engineering from Iowa State University. You can reach him at mdrues@vascularsci.com.